A Little Scary: Nano-Nukes | OhGizmo! By Evan Ackerman on 01/04/08 • Leave a comment! 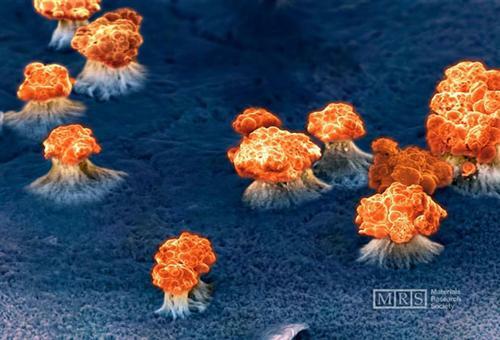 Please excuse the entirely misleading title; this is not, in fact, a picture of a nano-scale nuclear war. This image was one of the winners of the 2007 Science as Art competition. It’s actually a scanning electron micrograph of an overflowing nanowire array… The false color mushrooms you’re seeing are more like bubbles than explosions. Besides exploding prettily, what are nanowires good for? According to Wikipedia, nanowires might be good for quantum computing. Maybe these guys would have a use for it, then. Bigger version here, courtesy of Wired. View all of the winners at Nanowerk.